1. 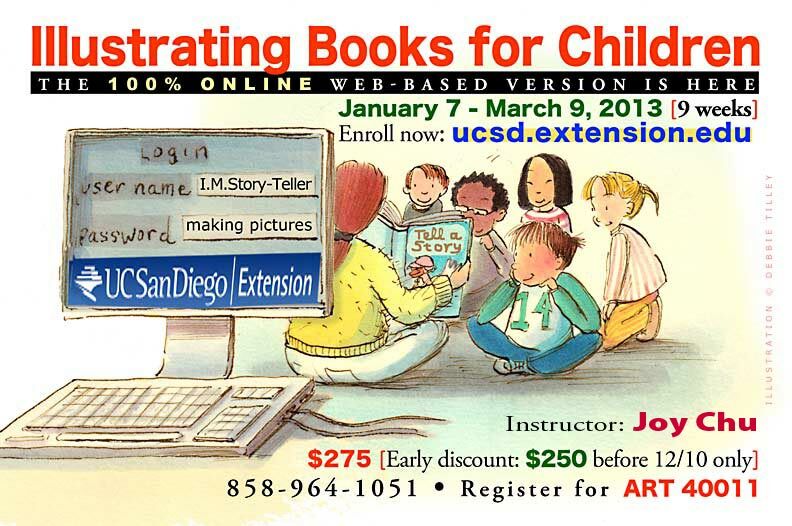 Take my on-line class Children’s Book Illustration: Thinking in Pictures, via UCSD Extension. 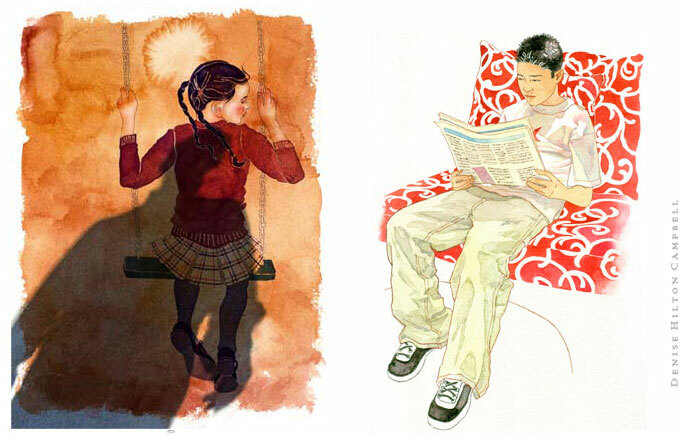 You can take it as part of the newly-created Certificate Program in Children’s Book Illustration. Or as a self-development work-out. Or as a hands-on means to explore the world of children’s picture books. You’ll read 8 new books a week, and progressively create 8-page, 16-page, 24-page, and 32-page stories by the end of the course. And you’ll meet colleagues who love story, from all over the world. 2. 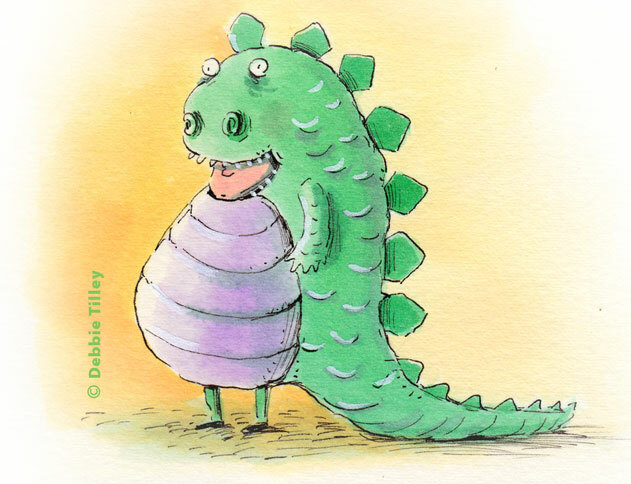 Create a creature, and share it online during KidLit Creature Week. You’ll see many familiar names submitting theirs! Complete instructions can be found here. I will be rolling up my sleeves to draw one up . . . and so will my students! Roar! Illustrator Denise Hilton Campbell was among the participants at my UCSD Extension class, “Illustrating Books for Children” last Spring. She has an extensive portfolio of published works for advertising and print. While she and I had worked together (I as art director/designer at Harcourt; she as illustrator) on several book jackets, she had never tackled the children’s picture book genre. While Denise’s preferred medium is watercolor . . .
. . . she also possesses superb drawing skills. 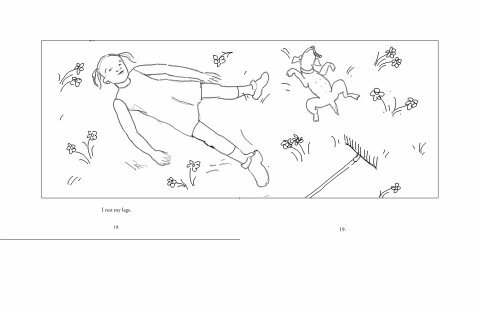 You can follow Denise’s own picture story on her process in creating her class assignment sketches, here. And check out the many finished pieces she produced post-class here. A sampling of her progressive experiments with one double-page spread from the above mentioned 32-page dummy follows, below . . .
Holiday Tip: Gift your favorite creative person with an Art Class! My Class is Coming Online! I’ve been away working with UCSD Extension to customize lessons plus on-line tools for the online version of my UCSD Extension class. I’m very excited about meeting new as well as seasoned illustrators and authors; seeing both old and new friends! It’s an opportunity to get together virtually to tell story with pictures, share our passion about it, and get our creative juices flowing. Special Bonus: For more about on-line learning, including free tutorials on what’s involved, take the course tour here. Find out beforehand if on-line learning is for you! You don’t need a password for this feature. Just click directly on the links in the right-hand column. In addition, every UCSD mobile class features additional free mini-tutorials to optimize your individual online experience. Yes, it’s that easy! Technical assistance is also available to all students. Questions? You are welcome to write in the comments section below.